If you are looking for my PTI January Blog Hop post, please scroll down or click here.. Thank you! Hello! 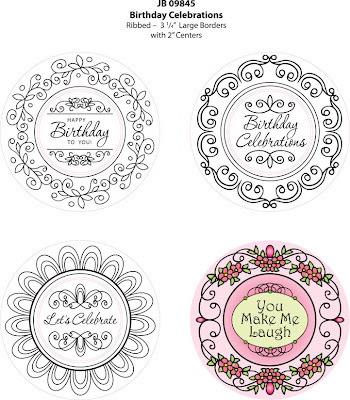 Today, JustRite Stampers is introducing a new ribbed set, JB-09845 3 1/4" Birthday Celebrations - Interlocking. This set is slightly different from our other 3 1/4" round sets as the borders are extra wide.. this new design allows it to be interchangeable with our stamps with 2" centers, such as JB-09835 2" You're So Sweet - Interlocking. For my main panel, I started with a sheet of pretty paper from Pink Paislee Sweetness and stitched some pink vellum onto it to soften it even more. I also stamped my sentiment onto a scrap of the same patterned paper. I stamped one of the swirly wide borders, cut it out as a frame, and popped it over my sentiment. I added a bit of color to frame by coloring the circle with my BG11 Copic marker and added a lot of ivory pearls all around the swirly frame. Enabler Alert! JustRite Stampers is making room in their warehouse for their 2011 Collection by having a retirement sale! Supplies are limited, so when these stamps are gone -- they are gone forever! If you are like me, you have a wish list a mile long.. so now is your chance to add some new stamps to your JR collection. Retirement sale is located HERE! 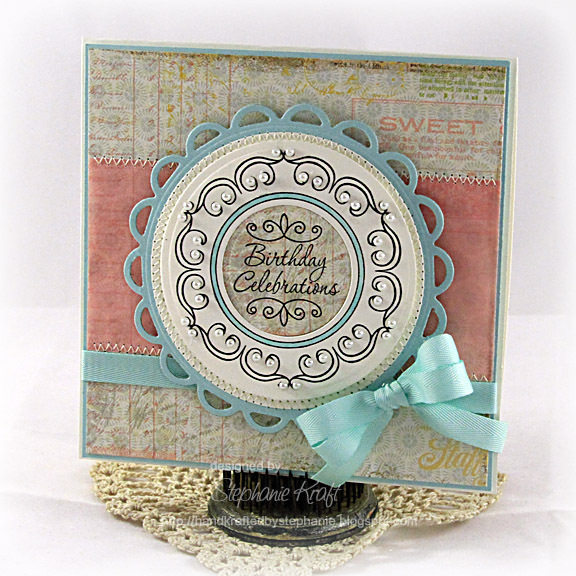 JustRite Stampers: JB-09845 3 1/4" Birthday Celebrations - Interlocking, JB-08117 Wood Stampers 3 1/4"
Accessories: Ribbon (Papertrey Ink), Ivory pearls (Pizzazz Aplenty), Bow Easy, Foam tape, Thread, Sewing machine. So pretty & pearly, Steph -- such a great birthday card! Very pretty, love the color combo and the touches of color. Stephanie I ADORE this color combo!!! WOW! Love this card!